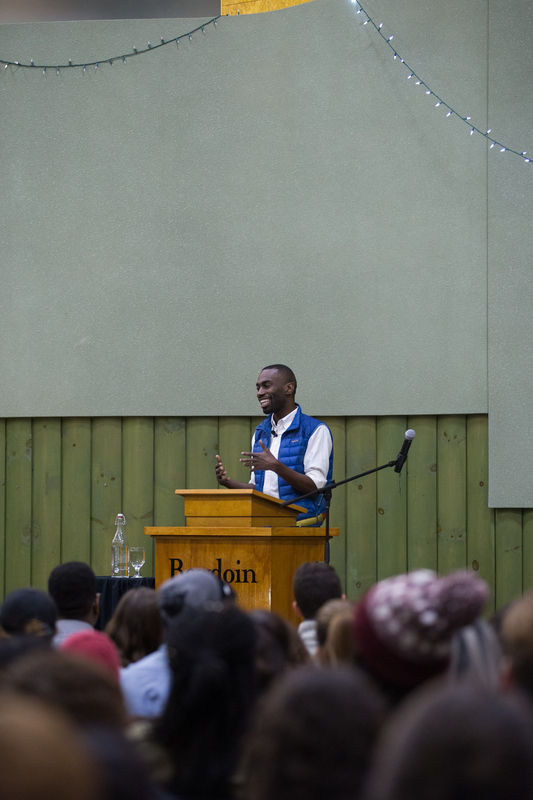 On Tuesday evening, activist, organizer and educator DeRay Mckesson ’07 returned to campus as the keynote speaker for No Hate November. He delivered his address to a packed audience in Morrell Lounge in Smith Union. Mckesson, an active leader in the Black Lives Matter movement, has used social media, especially Twitter, to spread awareness about the movement, its nationwide protests and the systems of oppression that they seek to change. He currently hosts the podcast “Pod Save the People,” where he interviews experts and political leaders and discusses current events each week. 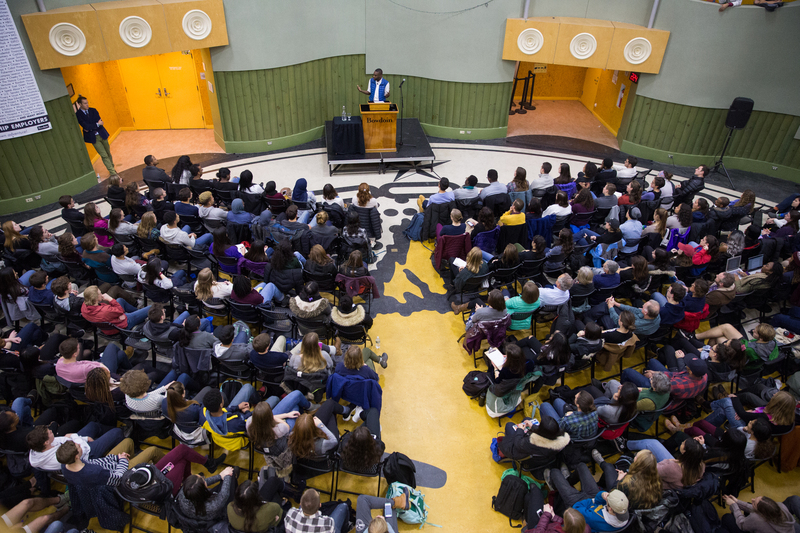 Twitter Titan: Activist, organizer and educator DeRay Mckesson ’07 addresses a full audience in David Saul Smith Union on Tuesday evening as the keynote speaker for No Hate November. Mckesson framed his speech as a list of concrete steps that ordinary people could take to become involved in the resistance movement, rather than as an attempt to rally people around his cause. 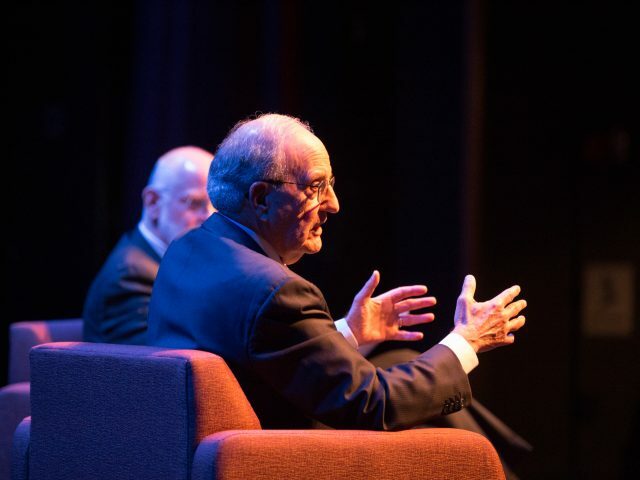 In his talk, Mckesson addressed the systems of oppression that he sees as continuing to beset the United States, most notably the criminal justice system and its discriminatory treatment of racial minorities. Mckesson urged optimism in spite of the abundant problems that the country faces, arguing that imagining a world that is more equitable and just than the one in which we currently live is one of the most important tasks we can undertake. Bowdoin Student Government President Irfan Alam ’18 asks Mckesson a question. “Our optimism has to be rooted in reality. It has to be rooted in a deep understanding of how systems and structures work today,” he continued. Still, Mckesson said that the work of righting racial injustices must not only be the work of people of color. Those who aren’t affected by racial bias must also be involved and asking these people to think through issues on a personal level will help achieve this goal. “If the goal is to help them learn, I think that we have to share the cognitive work,” he said. “I want you to have to think through this deeper than you’re thinking of it. People say Mike Brown stole something from the convenience store. I just say, should Mike Brown be alive today or not? I want you to work through this issue. I’m not going to preach the whole time, because when you preach they just say no,” he continued. 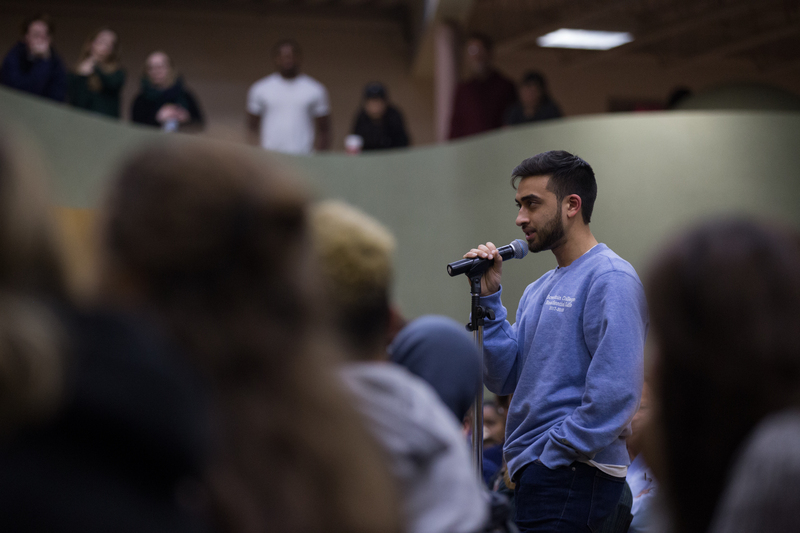 BSG Vice President for Student Affairs Salim Salim ’20 felt that Mckesson’s talk was conducive to the goal of No Hate November because it not only raised awareness but also encouraged action. Students, faculty and staff listen to Mckesson’s talk. Theodora Hurley ’20 initially reached out to Mckesson about coming to speak on campus after spending time this past summer listening to his podcast. 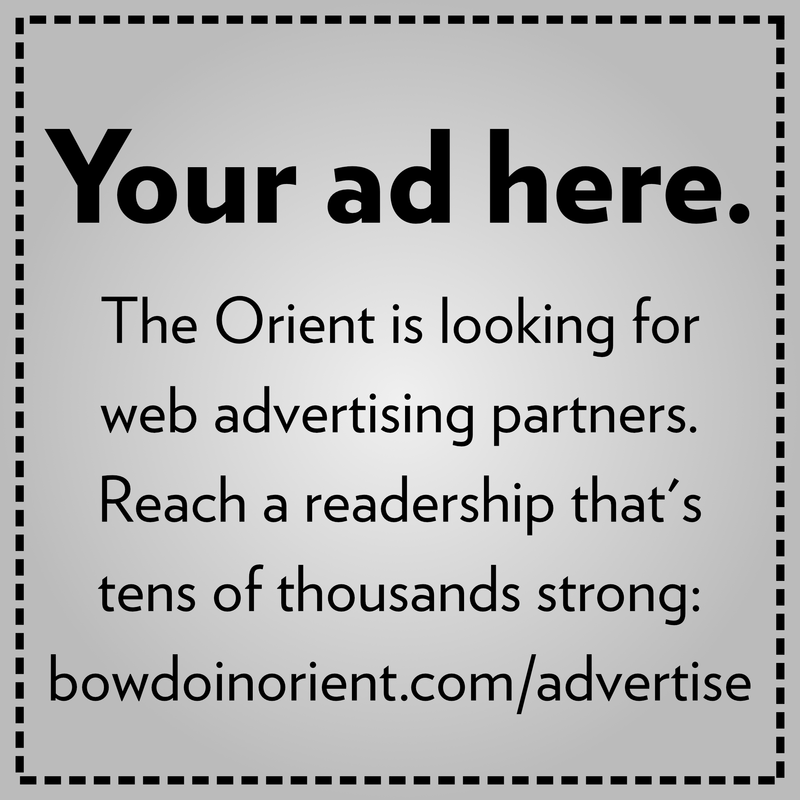 She felt that Bowdoin students would greatly benefit from hearing Mckesson’s calls for action. Hurley is a resident of Quinby House, which co-sponsored the event. Salim was encouraged by the number of people who came to see Mckesson’s speech. Mckesson, who has spoken before at Bowdoin, was excited to return to his alma mater. He spent the day leading up to the event and much of the day following the event meeting with numerous student groups on campus. 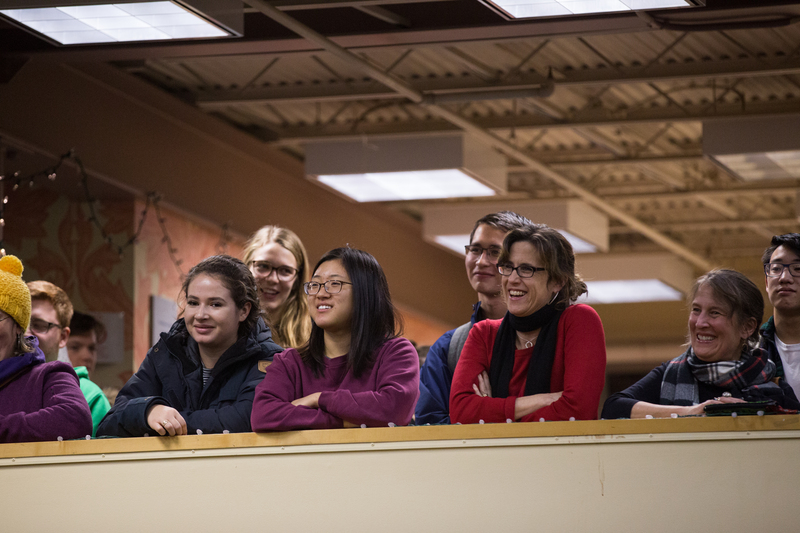 At Monday’s faculty meeting, faculty and staff discussed a plan to alter the schedule of both the academic and extracurricular day by adding 10 minutes between classes. While the detailed schedule has yet to be finalized, this specific change will be implemented for the fall 2018 semester. Currently, both the Senate and the House have passed versions of a revised tax code that would hit wealthy private colleges and universities with new taxes and restrictions. 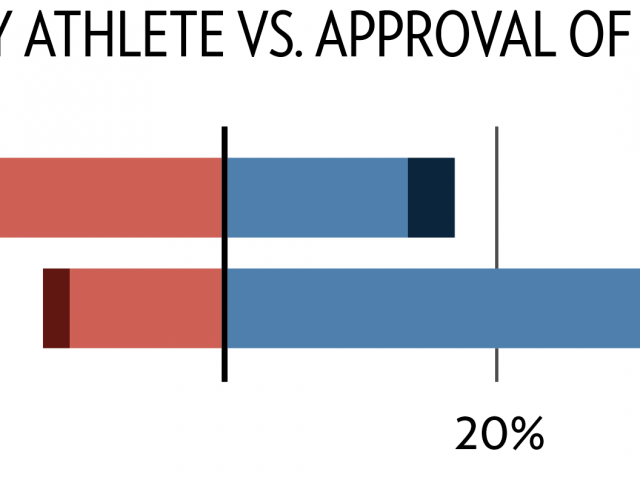 While there are significant differences between the Senate and House proposals, both would affect Bowdoin’s ability to, among other things, provide financial aid through a proposed tax on endowment earnings and a decrease in the number of taxpayers eligible to itemize charitable donations, which may disincentivize donating to the College.